The Map of India is our pride. Our national emblem, shows the nation’s boundary, and this site is about knowing, recognizing and respecting it. And, we demand respect for our motherland, our India. The Map of India is being abused and misrepresented all over the Internet, by nations, entities, organizations and individuals. Search engines and portals like Google, Facebook etc show up wrong, misrepresented and erroneous maps adding to the information poisoning. This has to stop and this is portal is an effort by a small team of concerned citizens to call out violators of Indian maps, and to try to spread the message and image of the correct map as far as possible. The correct map of the country is published by the Surveyor General of India and can be downloaded from their website here – in addition you can get all other maps you need so no need to download from all the Google or Facebook types which are dishing out fake maps. A country’s map is an assertion of its sovereign boundary which is the line on the ground separating it from its neighbors, and we have (very) unfriendly people to the west and north+east. The sanctity of our boundary is not respected by both sides. On the western front the contentious issue is.the northern and north east regions of the state of Jammu & Kashmir, occupied by Pakistan on one side and China on the other. The Pakistani occupied the territory in 1947 and it is now termed PoK. Pakistan claims Kashmir to be theirs and refuses to accept the fact that it acceded to India. They have fought (and lost) three wars but continue to be a thorn in the flesh for India, with their support for terrorist activity from across the border, continuous border skirmishes and shelling, breaking the peace. Thus there is now a Line of Control between India and Pakistan demarcating the Indian held territory and the Pakistan Occupied zone. A similar situation exists in the north eastern part of Kashmir where the Chinese claim the area known as Aksai Chin to be a part of Tibet, ans thus theirs. A Line of Control demarcates the territory held by them illegally, and this is the second thorn in our national boundary. A third thorn constantly pushed in is the continuous claim by China on Arunachal Pradesh. Their claim is that this is their land and that India occupies it. There are others but we will address them elsewhere.. The moot point of this site is the sanctity of the Map of India. The correct map depicting the official boundary of the country is published by the Office of the Surveyor General of India and no other map can be considered to be more authentic. It is the voice and statement of our national Government and must be respected. Unfortunately, many foreigners and (many Indians too) show scant respect for the depiction of our national boundary and abuse our national emblem amounting to criminal misrepresentation. And yes, this is a criminal offence in India, punishable by 6 months imprisonment. This scourge must be tackled and eradicated as soon as possible – and this is our effort (a small band of concerned Indian citizens). 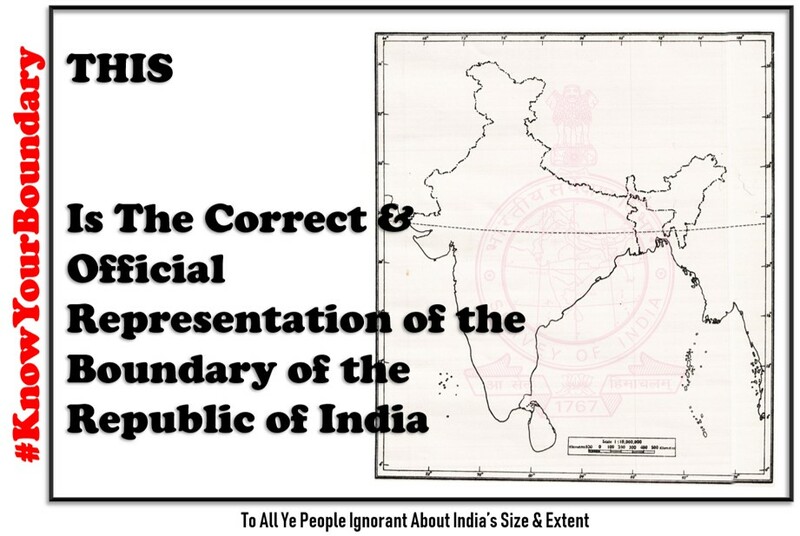 We will call out and pursue instances of wrong depiction of the map of India where we see it. We will follow up with the offenders on social media, thorough legal channels and through the Government and Police department. Our objective is simple – if you have insulted our national emblem, you have to apologise to the nation through a public post or a mail to the Survey of India, or to an Indian Government institution. You can use the ‘we are sorry’ page on this portal which will soon come up. Our logic for this action is simpler – thousands of Indian defence personnel are martyred every year since 1947 for protecting the sanctity of this boundary, and thousands of our civilian brethren are killed by our enemies along this line. The least we can do is to respect their sacrifice by ensuring that we use and propagate the correct depiction of the map. Not much to do as armchair patriots so what are we waiting for! Thank you for being concerned about our national pride and if you are here to do business or you are an Indian feel free to browse this site and to clear your doubts and learn about the map and it’s importance in our life. BTW if you are an Indian and you are a map violator, this is a good time for you to shed your shamelessness. Please take the right path to national respect and resurrect the feeling of national pride. You will not lose anything by believing in the nation, but if not, then be prepared to be called anti-national. We look forward to welcoming you to support the cause. Please use the comments box and reach out to us. PS: Enemies and idiots who do not understand the importance of a national boundary are not welcome! Awesome article. This article needs to be read by everyone. Schools and parents should also tell the children to #knowyourboundary. A fact that this Issue even needs to be raised by one person is a letdown. Each and every citizen should be a bearer of this cause and the ones who take this issue lightly be reprimanded publicly. Do share your ideas how we all can contribute. Well Done & All the best.